When will you make sure that you have visited them all? Most local people and many visitors will have visited the fantastic local attractions of Gretna Green, Caerlaverock Castle and Burns’ House at least once in their lifetime. However at Solway Tours we find it very frustrating that as the Gateway to Scotland we have so many fantastic places to visit yet to many of them remain “undiscovered”. We need to showcase all the high quality historic sites that we have across the Region and ensure that both locals and visitors do not miss out on some of our hidden gems. In Dumfries and Galloway we do seem to lack a bit of confidence at times about “shouting loudly enough” about some of our incredible historic attractions. We are incredibly proud of the role our Region has played in shaping the nation of Scotland and the wider global community beyond our shores but there is so much more that we could highlight to ensure that more people know about the impact that our local area and local people have had! Below we have outlined TEN places that everyone should visit at least once when visiting or living in the local area. We had to stop at ten but could have outlined many more. The largest stone circle in mainland Scotland and the seventh largest in the UK. Experts suggest that the circle is Neolithic and approximately 4000 years old. Wonder what really went on inside this circle? A mid-12th Century Motte and bailey castle with some spectacular earthworks still visible today. You can walk up to the top of the Motte and wonder at the size of one of the largest fortifications of this kind in Scotland. 3. Orchardton Tower near Palnackie in the Stewartry. A unique construction as it is the only circular laird’s tower house built in late-medieval Scotland. 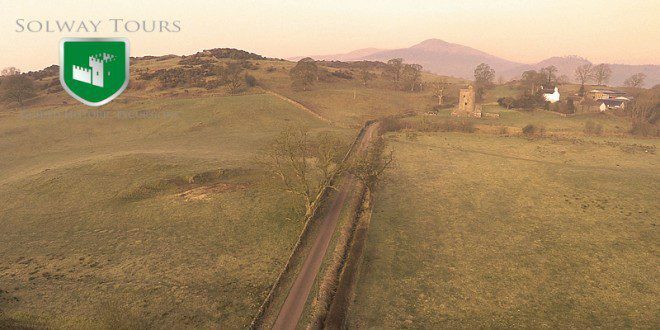 The builder was John Cairns, who acquired Orchardton in 1456 and he created this fantastic tower house which you can still climb the narrow staircase to the top. The cave is about 7m long and 3m high. St Ninian’s Cave is traditionally believed to have been used as a place of personal retreat and prayer by St Ninian, who founded the first church at Whithorn sometime in the 390s. It is accessed by a lovely coastal path and beach walk. The native hill fort dominates the area for miles around, and was the site of a siege during the early conquest of Scotland, with large marching camps built on both the north and south sides, that on the south later turned into a training camp where Roman soldiers would be sent to learn artillery skills. A steep walk but well worth it for the site and the views! This superb building in the heart of Dumfries was founded as a priory for Benedictine nuns in the 1160s but two hundred years later in 1389 another Archibald ‘the Grim’, 3rd Earl of Douglas, had the nunnery replaced by a college of secular canons. His son, Archibald, 4th Earl, began the process of building what the visitor sees today and his widow Princess Margaret, daughter of Robert III, was buried there in 1450, and her fine tomb still graces the choir. The college survived the turmoil of the Protestant Reformation of 1560 but was effectively abandoned by 1600. This site contains two remarkably complete Neolithic burial cairns situated on a hill offering fine views over Wigtown Bay. On a hillside overlooking Wigtown Bay, two Neolithic chambered tombs lie within 150m of each other. These cairns date back almost 6000 years and once contained the remains of some important Galloway residents. Two fantastic sites in one both linked to the incredible life of Henry Duncan. Duncan’s life is explained in great detail by the fantastic guide at the Museum and then you can wonder at the incredible 8th Century Anglo Saxon cross within the local church. A must see! The Border Reivers is such an incredible story of the lawless debatable lands between Scotland and England. This towerwas built around 1520 by Johnnie Armstrong one of the richest men in the area. In 1530 Johnnie and 50 followers were hanged by James V of Scotland, after being tricked into joining a hunting party, an event recorded in the ballad “Johnnie Armstrong”. The tower nestled beside the River is now the home of Clan Armstrong. The inventor of the bicycle lived and worked in the local area. How many people in the world owe their travel to work, leisure time and fitness to this local man? The gravestone is in the old Kirkyard and a plaque marks the Smiddy where Macmillan worked on his life changing invention. A local hero! How many have you managed to visit? Why don’t you let us know about what your undiscovered historic gems are? We are aware that there are lots of evocative and inspiring sites to visit in the local area. Solway Tours – An enjoyable and unique personalised chauffeur driven service covering South West Scotland and beyond. Mark Turner and Lesley Wilson run Solway Tours and provide guided historic tours in Dumfries & Galloway and beyond. Experience your own private chauffeur driven guided historic tours covering all areas of Scotland.